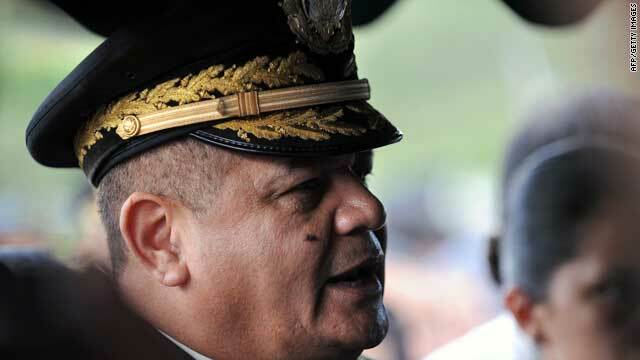 The Chief of the Honduran Armed Forces, Gen. Romeo Vasquez Velasquez, as pictured on October 27, in Tegucigalpa. (CNN) -- Honduran prosecutors issued arrest warrants for the country's six top military commanders for abuse of power in connection with the coup that ousted President Jose Manuel Zelaya last year. The Honduran high command, including Gen. Romeo Vasquez Velasquez, the country's top military chief, face charges for bursting into Zelaya's residence and transporting the president to neighboring Costa Rica, Attorney General Luis Rubi said. The June 28 coup deepened a political crisis that remains unresolved, despite a new president being elected in November. Rubi himself filed the arrest warrants at the Supreme Court on Wednesday. In addition to abuse of power, the military commanders face charges of illegal expatriation of a citizen. The manner in which Zelaya was ousted was key in how other countries and international bodies interpreted the military action. The de facto government of Roberto Micheletti and his supporters have insisted that Zelaya's removal was a constitutional transfer of power. The crisis erupted in June when Zelaya -- despite congressional and supreme court decisions calling it illegal -- pushed forward with a plan to hold a referendum that could have led to changing the constitution to allow for additional presidential terms. The Supreme Court signed an arrest warrant for Zelaya but not to send him into exile. Now, the Supreme Court has three days to decide whether to ratify the charges and start a case against the military officers. Armed Forces spokesman Col. Ramiro Archaga said that the military respects the rule of law and are willing to appear before the justice system. The announcement of the arrest warrants came as U.S. Deputy Assistant Secretary of State for Western Hemisphere Affairs Craig Kelly visited with the key players in the crisis in Honduras. Kelly met with Micheletti Wednesday, though details of the talks were unknown except for a statement from acting Honduran Foreign Minister Carlos Lopez Contreras, saying that calls for Micheletti's resignation were not part of the dialogue. Meanwhile, Zelaya remained holed up inside the Brazilian Embassy in the Honduran capital of Tegucigalpa. He has been there ever since sneaking back into the country in September. In another development, the Honduran congress was to take up the issue of amnesty for Zelaya and other players in the crisis next week. Journalist Elvin Sandoval contributed to this report.